Wirfin Obispo does not have any MLB stats for the season. October 30, 2018 RHP Wirfin Obispo assigned to Estrellas Orientales. February 1, 2018 RHP Wirfin Obispo assigned to Dominican Republic. December 26, 2017 RHP Wirfin Obispo assigned to Leones del Escogido. October 14, 2017 RHP Wirfin Obispo assigned to Estrellas Orientales. February 1, 2017 RHP Wirfin Obispo assigned to Dominican Republic. December 26, 2016 RHP Wirfin Obispo assigned to Tigres del Licey from Estrellas Orientales. October 20, 2016 RHP Wirfin Obispo assigned to Estrellas Orientales. February 2, 2016 Sultanes de Monterrey signed free agent RHP Wirfin Obispo. January 30, 2016 RHP Wirfin Obispo assigned to Dominican Republic. October 16, 2015 RHP Wirfin Obispo assigned to Estrellas de Oriente. July 25, 2015 Colorado Springs Sky Sox released RHP Wirfin Obispo. June 1, 2015 RHP Wirfin Obispo assigned to Colorado Springs Sky Sox from Biloxi Shuckers. March 11, 2015 RHP Wirfin Obispo assigned to Milwaukee Brewers. January 28, 2015 RHP Wirfin Obispo assigned to Dominican Republic. December 7, 2014 RHP Wirfin Obispo assigned to Colorado Springs Sky Sox. 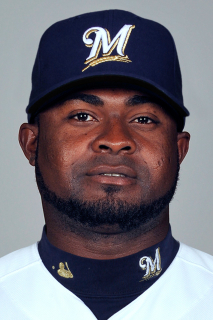 December 2, 2014 Milwaukee Brewers signed free agent RHP Wirfin Obispo to a minor league contract. August 21, 2014 Pittsburgh Pirates sent RHP Wirfin Obispo outright to Indianapolis Indians. August 13, 2014 Pittsburgh Pirates designated RHP Wirfin Obispo for assignment. June 1, 2014 Pittsburgh Pirates claimed RHP Wirfin Obispo off waivers from Atlanta Braves. June 1, 2014 Pittsburgh Pirates optioned RHP Wirfin Obispo to Indianapolis Indians. May 31, 2014 Atlanta Braves designated RHP Wirfin Obispo for assignment. March 14, 2014 Atlanta Braves optioned RHP Wirfin Obispo to Gwinnett Braves. November 1, 2013 Atlanta Braves selected the contract of Wirfin Obispo from Gwinnett Braves. November 5, 2012 Atlanta Braves signed free agent RHP Wirfin Obispo to a minor league contract and invited him to spring training. November 2, 2012 RHP Wirfin Obispo elected free agency. June 23, 2012 RHP Wirfin Obispo assigned to Pensacola Blue Wahoos from Louisville Bats. May 12, 2012 Wirfin Obispo assigned to Louisville Bats from Pensacola Blue Wahoos. April 24, 2012 Wirfin Obispo assigned to Pensacola Blue Wahoos from Billings Mustangs. April 1, 2012 Wirfin Obispo assigned to Louisville Bats. April 1, 2012 Wirfin Obispo assigned to Arizona Diamondbacks. February 2, 2012 Cincinnati Reds signed free agent RHP Wirfin Obispo to a minor league contract. October 16, 2009 RHP Wirfin Obispo assigned to Estrellas de Oriente. March 12, 2007 DSL Reds released RHP Wirfin Obispo.